July 30, 2012, Vancouver, Canada; El Nino Ventures Inc. ("ELN" and the "Company") (TSX.V: ELN; OTCQX: ELNOF Frankfurt: E7Q) is pleased to announce assay results from the latest round of drilling at the Murray Brook polymetallic massive sulfide deposit, Bathurst Mining Camp, New Brunswick (Figure 1). The drill program commenced February 9, 2012 and was completed June 17, 2012. Ninety seven vertical holes have been completed for a total of 18,470 metres drilled. 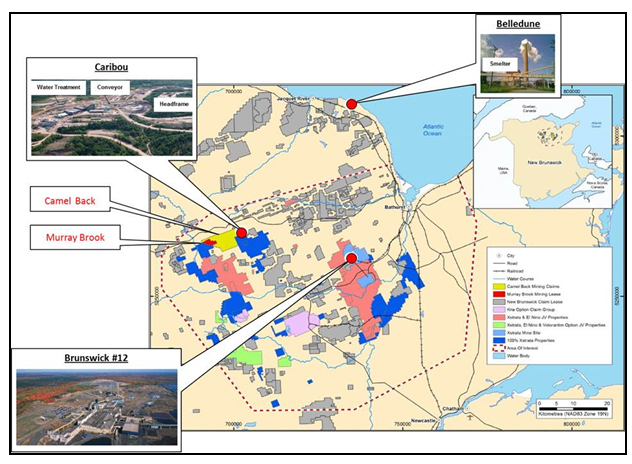 Results of the 2012 drill program have been successful in identifying two distinct massive sulfide zones. Holes MB-2012-114, MB-2012-115, MB-2012-117 and MB-2012-118 reported herein were drilled in the Western Zone (Figure 2), which is thicker and more Zn-Pb-Ag rich than the Eastern Zone. 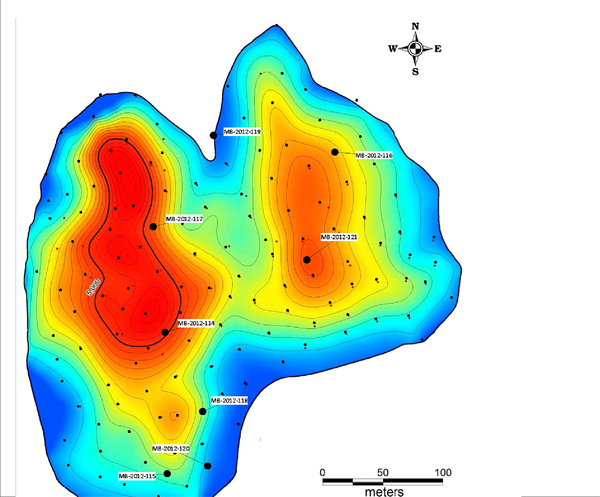 Holes MB-2012-116 and MB-2012-121 were drilled in the Eastern Zone (Figure 2), which is thinner and more Cu-Au rich. MB-2012-119 and MB-2012-120 were drilled to better delineate the boundaries of the East and West Zones respectively (Figure 2). 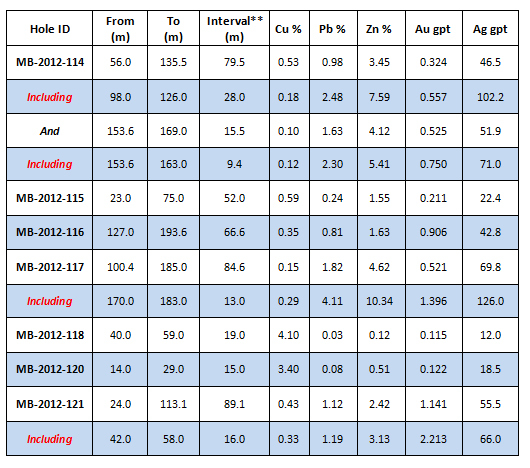 The assay results for the Western Zone are better (Table 1). Drill hole MB-2012-117 intersected 84.6 metres of 4.62% zinc, 1.82% lead, 0.15% copper, 0.521 gpt gold and 69.8 gpt silver (Table 1). This interval includes 13 metres grading 10.34% zinc, 4.11% lead, 0.29% copper, 1.396 gpt gold and 126.0 gpt silver from 170 metres down hole. Drill hole MB-2012-114 intersected 79.5 metres of 3.45% zinc, 0.98% lead, 0.53 % copper, 0.324 gpt gold and 46.5 gpt silver. This interval includes 28 metres grading 7.59% zinc, 2.48% lead, 0.18% copper, 0.557 gpt gold and 102.2 gpt silver from 98 metres down hole. MB-2012-114 also intersected mineralization 9.4 metres of 5.41% zinc, 2.30% lead, 0.12 % copper, 0.750 gpt gold and 71.0 gpt silver from 153.6 metres down hole. Figure 1 - Land tenure map showing the location of the Murray Brook Project in the northwest part of the Bathurst Mining Camp, New Brunswick. To date, more than 28,000 metres of drilling has been completed with encouraging results. The Technical Report on the 2012 NI 43-101 Mineral Resource Estimate is filed on SEDAR.com and is available on ELN's website.